You may or may not remember that last season, a pathetic Interista child called Filippo displayed a banner which begged his team to win lest he should be mocked at school, as their record was atrocious. 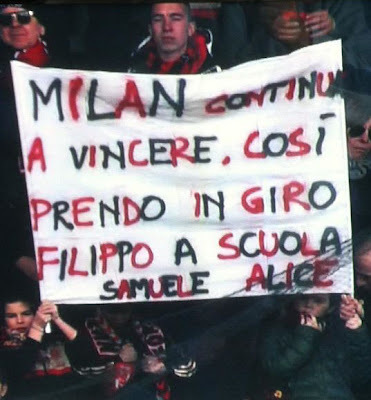 Despite having been defeated by this atrocious team in the derby recently, Milan were quite the opposite, prompting an adorable duo called Samuele and Alice to hold up the following sign asking the to keep winning so that they could make fun of Filippo at school. Well now the tables have turned a little bit, only at least Milan have an excuse for our overall poor form, we lost half our team this summer, including our best players. But still, Samuele and Alice need our help, or that snot-nosed little Filippo will be mocking them at school. 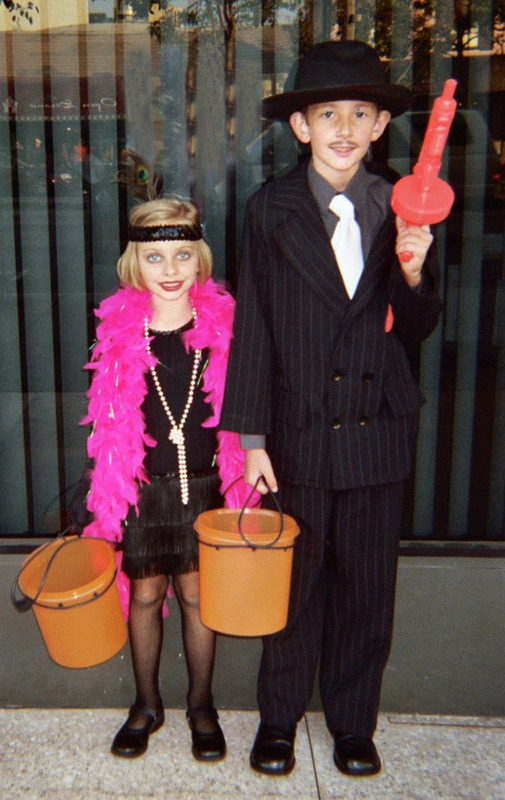 Poor little Samuele and Alice, they need some street cred! Usually, I look forward to the legendary Derby della Madonnina with bloodlust. But this year, I feel like the only thing I may have to look forward to is the end of the season, even if we pulled off a huge win on Wednesday. I swear, one of these matches this season is going to make me take up drinking. (Focus, Elaine, this one is for the kids.) But this derby will be tough, and I would say we are definitely the underdogs, for our squad alone. For one thing, Inter are 4 and 2 in the league so far. And despite an embarrassing loss to Siena, their form has been much more solid than ours. We do have one tiny advantage over them – despite losing both derbies to them last year, we did qualify for the Champions League. Which means our boys will have gotten back from St. Petersburg a full day earlier than those Interisti did from their Europa League match yesterday in Azerbaijan. So we’ll be a little more rested. Yay. Now we’re totally going to win. Oh, wait, Stramaccioni rested a bunch of his best players, Allegri didn't so much. So not even that advantage. Last year, Allegri was outdone first by the Tinkerman, Claudio Ranieri, who didn’t get much else right in his short time at the club. Then he was outdone by Stramaccioni, who had just fallen off the turnip truck… er… promoted from coaching the Inter Primavera squad. So he could really use a win or at least a draw to restore some hometown credibility. Then there is the added interest this year of the infamous Cassano-Pazzini swap. Milan fans rejoiced when Pazzini scored a hat trick against Bologna, but he has failed to score otherwise in 6 appearances. Whereas Cassano has a wicked 4 goals in 4 appearances. Can Pazzini come good for Samuele and Alice? Or will the one who keeps moaning how “Milan didn’t love him” punish us for our said crimes? With the whiny Wesley Sneijder ruled out for a month due to injury, Cassano has a very high likelihood of making Filippo proud. I don’t want Filippo to be proud. I want him to cry into his banner on Monday, even if the odds are that it will be Samuele and Alice crying. Stramaccioni and company broke their own San Siro curse on Sunday with a convincing win over a strong Fiorentina side. He lined up Handanovic, Samuel, Juan, Ranocchia; Cambiasso, Gargano, Coutinho, Nagatomo, Zanetti; Cassano, and Milito. Milito’s goal came off of a penalty, but Cassano… well, I don’t miss his primadonna ways, but I wouldn’t mind having his form right about now. Maybe we can lure him off the pitch with some Nutella or distract him with some other food. Allegri on the other hand is predictably unpredictable. And being under fire has made him even more so. After playing midweek away to Zenit, will he rest some players on Sunday, or will he go all out and risk everything for the win? His track record says the latter, but with this Budget Milan™ squad, maybe he’ll think twice? Who knows? I’m going to go with Abbiati; Abate, Zapata, Yepes, De Sciglio; De Jong, Ambrosini, Nocerino; Boateng, Pazzini, and El Shaarawy. He’ll prove me wrong, he hates my guesses. All I can say is that we’ve got to get behind our team. If you can possibly make it to Milan, this would be a game to show up and make some noise at. Our boys are going to need every ounce of support they can get to pull off this small miracle. And speaking of small miracles, if we don’t pull off at least a draw, and Filippo dares mock Samuele and Alice, I’ve got some news for him. They’ve got some cugini in America called Massimo and Sofia. And Massimo and Sofia don’t play by the same rules, see. They’d love nothing more than to pop a little snake like Filippo. So Filippo, consider yourself warned. And everyone else, Samuele and Alice need you. This post inspired by my two favorite Milanisti, Massimo and Sofia. Ti amo! This match will be broadcast on RAI and BeIN Sport in the U.S.